This morning, I got my spring copy of the BCS HCI magazine Interfaces. I’m pleased to be published in this quarter’s issue, as part of the “My PhD” series. In the article, I give a brief overview of my general project, and then run through some of the usability heuristics that we’ve been developing for novice programming tools. 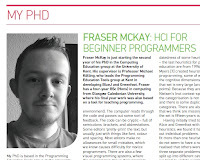 McKay, F. HCI for Beginner Programmers. Interfaces, British Computer Society, 90 (2012), 22-23. Update 19/04/12: an open-access PDF is available from the BCS. My PhD is based in the Programming Education Tools group at the University of Kent, and my project concerns the development of a new way for novices to enter and maintain code. Coding in schools has recently been a more topical issue than usual . Most of my work so far has been about analysing existing systems, but I’ve also begun to work with some early designs. My review of existing systems has been structured with thirteen new heuristics. 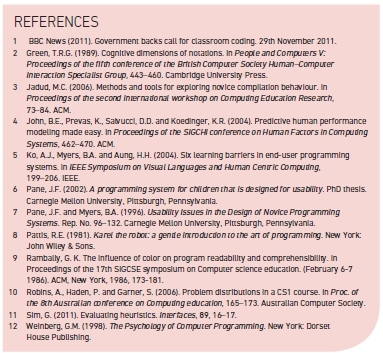 These are based on previous heuristics , the cognitive dimensions , and a wider review of the literature on novice programming errors. For specific features, Cog Tool models  have exposed subtle differences in the effort a novice might need to exert to make changes in two comparable code editors. Now, at the start of my second year, I am working on prototypes that might make it into a new programming tool.